We all think we’re unique; we all like to think that we “think different” from one another, and act different too. Well, maybe that’s true, but it’s also a fact that in this modern world we are trackable and predictable: enter big data. Any pretense of anonymity is just that — a pretense. Summary article by Tim McElligott in FierceBigData, original by Patrick Tucker for MIT Technology Review (and posted in Mashable). Is anonymity already a lost cause? The first laws written for the European Union related to the privacy of personal data came in 1995, a world away from the big data realities of today. In a piece written for MIT Technology Review this week (found on Mashable) Patrick Tucker said the definition of personal data has evolved to include far more information than those European legislators could ever have imagined. Not only has personal data evolved, but other identifiable data has evolved along with it. 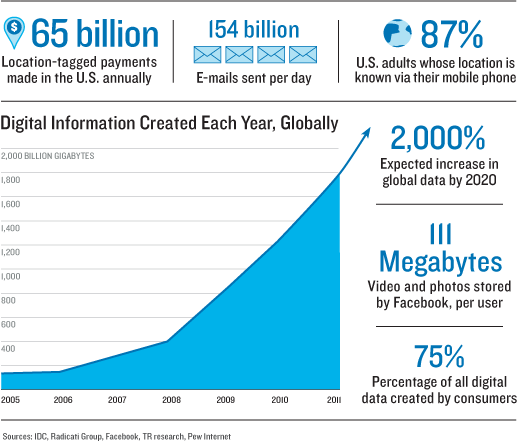 There are 65 billion location-tagged payments made by individuals in the United States every year. 87 percent of U.S. adults’ locations are known because of their cell phones, according to IDC. In 1995, this data was distinct and separate. It had no relation to other data associated with individuals. That’s all changed now. Even data stored in ways meant to remove personally identifiable information have proved unsafe. Modern data science has found ways to link them. Princeton University computer scientist Arvind Narayanan said the more data there is, the less any of it can be said to be private. He said it was becoming “algorithmically impossible” to maintain anonymity. Companies like Acxiom, Narayanan added, hold an average of 1,500 pieces of information on more than 500 million consumers around the world. Much of this data was provided prior to any disclosure agreements or knowledge on the individual’s part that the information would be bought and sold on the market like corn futures. In 1995, the European Union introduced privacy legislation that defined “personal data” as any information that could identify a person, directly or indirectly. The legislators were apparently thinking of things like documents with an identification number, and they wanted them protected just as if they carried your name. Today, that definition encompasses far more information than those European legislators could ever have imagined—easily more than all the bits and bytes in the entire world when they wrote their law 18 years ago. Here’s what happened. First, the amount of data created each year has grown exponentially: It reached 2.8 zettabytes in 2012, a number that’s as gigantic as it sounds, and will double again by 2015, according to the consultancy IDC. Of that, about three-quarters is generated by individuals as they create and move digital files. A typical American office worker produces 1.8 million megabytes of data each year. That is about 5,000 megabytes a day, including downloaded movies, Word files, email, and the bits generated by computers as that information is moved along mobile networks or across the Internet. Much of this data is invisible to people and seems impersonal. But it’s not. What modern data science is finding is that nearly any type of data can be used, much like a fingerprint, to identify the person who created it: your choice of movies on Netflix, the location signals emitted by your cell phone, even your pattern of walking as recorded by a surveillance camera. In effect, the more data there is, the less any of it can be said to be private. We are coming to the point that if the commercial incentives to mine the data are in place, anonymity of any kind may be “algorithmically impossible,” says Princeton University computer scientist Arvind Narayanan. We’re well down this path already. The types of information we’ve thought of as personal data in the past—our name, address, or credit card records—are already bought and sold by data brokers like Acxiom, a company that holds an average of 1,500 pieces of information on more than 500 million consumers around the world. This was data that people put into the public domain on a survey form or when they signed up for services such as TiVo. Did you just finalize a divorce or become an empty nester? Such “life events,” which move people from one consumer class to another, are of key interest to Acxiom and its advertising clients. The company says it can analyze its data to predict 3,000 different propensities, such as how a person may respond to one brand over another. Yet these data brokers today are considered somewhat old-fashioned compared with Internet companies like Facebook, which have automated the collection of personal information so it can be done in real time. According to its financial filings at the time of its IPO, Facebook stores around 111 megabytes of photos and videos for each of its users, who now number more than a billion. That’s 100 petabytes of personal information right there. In some European legal cases, plaintiffs have learned that Facebook’s records of their interactions with the site—including text messages, things they “liked,” and addresses of computers they used—run to 800 printed pages, adding up to another few megabytes per user. In a step that’s worrisome to digital-privacy advocates, offline and online data sets are now being connected to help marketers target advertisements more precisely. In February, Facebook announced a deal with Acxiom and other data brokers to merge their data, linking real-world activities to those on the web. At a March investor meeting, Acxiom’s chief science officer claimed that its data could now be linked to 90% of U.S. social profiles. Such data sets are often portrayed as having been “anonymized” in some way, but the more data they involve, the less like that is to be actually true. Mobile-phone companies, for instance, record users’ locations, strip out the phone numbers, and sell aggregate data sets to merchants or others interested in people’s movements. MIT researchers Yves-Alexandre de Montjoye and César A. Hidalgo have shown that even when such location data is anonymous, just four different data points about a phone’s position can usually link the phone to a unique person. The greater the amount of personal data that becomes available, the more informative the data gets. In fact, with enough data, it’s even possible to discover information about a person’s future. Last year Adam Sadilek, a University of Rochester researcher, and John Krumm, an engineer at Microsoft’s research lab, showed they could predict a person’s approximate location up to 80 weeks into the future, at an accuracy of more than 80%. To get there, the pair mined what they described as a “massive data set” collecting 32,000 days of GPS readings taken from 307 people and 396 vehicles. Sadilek and Krumm called their system “Far Out.” That’s a pretty good description of where personal data is taking us.